Here's a breakdown of next month's happenings--January's chock full of actionable resolutions. Pick at least one to support and if you can't be in attendance please share the info socially. Also, let me know if I missed anything! Welcome to our first 2018 meeting! The "HIPPY HAPPY HALF HOUR" starts at 6:30 with the meeting beginning at 7 PM. Trio has the best food, beer and wine! We will be downstairs by the bar(like where else would we be). We are really honored that they were willing to host us. Once a month, we will be learning one cannabis strain and one disease that it helps. Lobby Days in Raleigh will be happening this year and we want the OBX represented!! We are fighting for our choice in how we heal our loved ones. ALL WOMEN ARE WELCOME! With 50 plus women strong, We can do this OBX!!!!! Want to break into the biz? On 01/25 The Hemp Farmacy in Wilmington is holding a Hemp Apprentice 101 - Outside Sales Rep Course from 4-6pm. Contact me to set up a fundraiser at your next event! I will be offering access2green in NC merchandise at various meetings and events throughout the state. %15 of sales will go to the hosting nonprofit and attendees will receive 10% off all items . 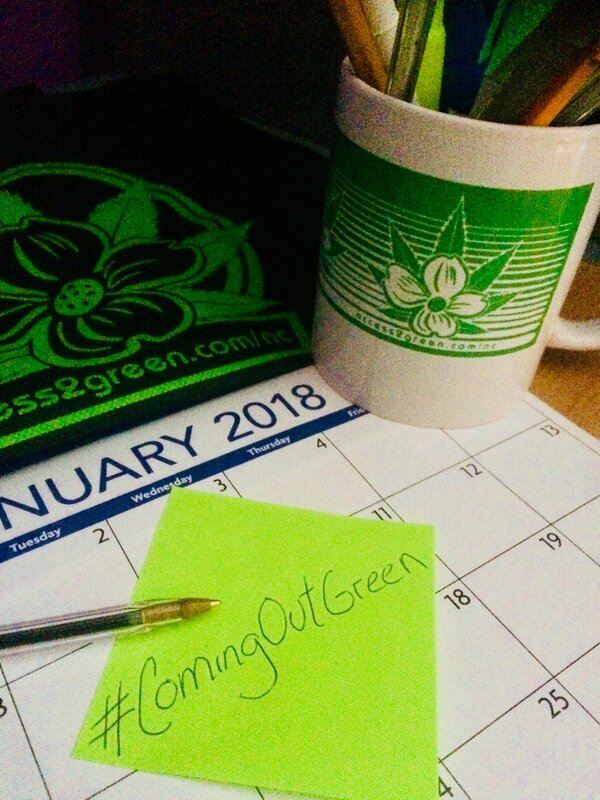 Come see me on January 13, 2018 - 4:20 pm at NORML of the Catawba Valley Monthly Meeting in Conover!